In this polymer clay tutorial I explain how to make different millefiori canes for leaves and petals of the orchid, how to shape the leaves, and how to sculpt miniature cattleya orchids with spotted petals and a striped lip. I also show how to make the textured polymer clay base, how to add patina to it, and how to apply all sculpted leaves and flowers to the base. Almost fifty big full-color pictures showing every step. 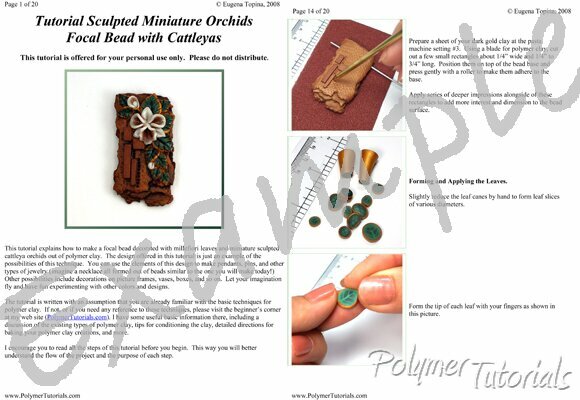 The first three pictures on this page show the bead described in this tutorial. The last picture demonstrates a variation of this technique. Place a mouse over the small pictures to see them enlarged.